Save water during your washdown process! The Strahman washdown equipment has become the standard for numerous industrial and commercial applications in the refinery, chemical, petrochemical, oil/gas, mining, pulp and paper, polymer, pharmaceutical, food processing and service, beverage and dairy industries. Strahman provides complete washdown solutions with a range of: Washdown trigger guns and nozzles, swivels, mixing units, lances and accessories. 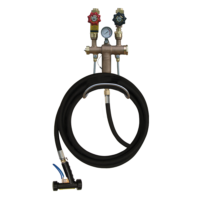 Spray nozzles, handles, hoses, goose neck springs, risers, hose reels, and Pivot Pro™ swivel connectors. Designed for use in restaurants, hotels, supermarkets, and all commercial kitchens, food serving and food preparation applications. See how much water is saved with Kwik Clean 3® Spray Nozzle Performance Comparisons. Range of Valves for use in the chemical, petrochemical, oil and gas, pharmaceutical and other industries. Drain Valves designed to prevent clogging. Line Blinds which provide zero leakage and total isolation on process pipelines. Strahman is the global leader in the design and manufacture of the highest quality, innovative wash down equipment and custom process valves. Strahman products remain the premier standard for numerous industrial and commercial applications in the refinery, chemical, petrochemical, oil/gas, mining, pulp and paper, polymer, pharmaceutical, food processing and service, beverage and dairy industries. Many industries need efficient washdown supplies. Particularly in dairy, pharmaceuticals, agricultural, petrochemical, mining, dairy, and food processing businesses, washdown supplies are an essential part of maintaining safe and sanitary conditions. As each industry is distinct, and each business unique, you need customised solutions that work correctly for your team and infrastructure. We boast a wide selection of washdown supplies suited for any application. Process washdown valves and nozzles designed for the chemical, petrochemical, oil and gas, and pharmaceutical industries. These include drain valves which combat clogging as well as line blinds to eliminate leakage. Sampling valves to take product samples in batch tanks correctly and precisely. 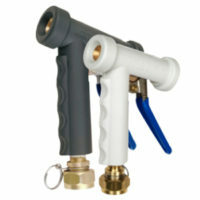 Numerous other kinds of washdown supplies and equipment including spray nozzles, handles, hoses, and swivel connectors. Hotels, foodservice businesses, commercial kitchens, supermarkets can all benefit from the enormous variety we carry. As every industry is different, you may employ our equipment in a variety of ways to suit your needs. 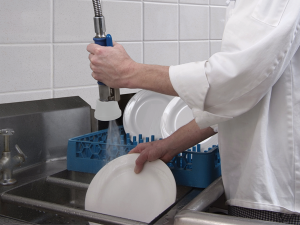 Food and Beverage – Foamers and sanitisers by Lafferty Equipment come in a variety of precise options to eliminate concerns of cross-contamination and ensure that your surfaces remain clean and sanitary. Dishwashers and sanitisers can also be supplemented with spray nozzles for pre rinsing applications washing by hand in three-bay sinks and other configurations. Mining – Our designs are expertly designed to assist your business with dust suppression, fire protection, equipment lubrication, washing and residue dislodging, vehicle washdown, as well as pollution control. Ensure that your business adheres to all environmental and occupational regulations to keep your workers safe and your business clean. Pharmaceutical – While there are some overlaps both with mining and the food and beverage industries, pharmaceutical firms also have unique concerns that can be addressed with the appropriate nozzles. Spray dryers assist with atomising even viscous and difficult to remove parts of solutions, meaning that you can more easily extract the desired solute. The applications of our technology don’t stop there. Browse through our catalogue or enquire with us directly to learn how we can assist your business. We’ve spent over 30 years serving New Zealand’s industries with our spray technology. We pride ourselves on innovation and user-friendly design, which has led to our tremendous variety of products. Our fellow Kiwi businesses can easily find the exact tool needed for the job, and this specialisation results in greater efficiency and lower costs. While the savings are often veiled in the moment, the incremental benefits of more productive employees and easier adherence to regulations generate a massive advantage for any business over months or years. Let us address any problems that you encounter in your daily operations. Whether your difficulty is residual build-up on nozzles or needing effective washdown procedures in confined spaces, we have precise solutions that will impress you and streamline your business. Contact us today to learn how we can improve your operations.